Let Avant-Garde be on the frontline for you. Avant-Garde provides advisory and appraisal services for fine art, specializing in Modern, Postwar and Contemporary art. Whether you’re a new collector or seasoned connoisseur, Avant-Garde will assist with you with buying, selling, or valuing your art. Avant-Garde also provides generalist appraisals, advisory and cataloging services for your personal property or for Estates. With our intimate knowledge of the art, antiques and retail markets, we’ll handle the research, negotiations, and logistics to make sure you get the full value of your treasures. Avant-Garde provides appraisals of fine art, specializing in Modern, Postwar and Contemporary art. We appraise paintings, prints, photographs, works on paper, sculpture, mixed media and more. Avant-Garde also provides generalist (Estate) appraisals of personal property, which includes furniture, decorative arts, and other household contents. Whether you’re responsible for taxes on your late grandmother’s Estate, or insuring your art collection against damage or loss, Avant-Garde will be on the frontline for you. Our appraisals are compliant with the professional and ethical standards of the Uniform Standards in Professional Appraisal Practice (USPAP) and IRS requirements. Damage & Loss for work damaged by flooding, fire, etc. Equitable Distribution for divorce, inheritance distribution, etc. Whether you’re starting a collection or need to clear some wall space, Avant-Garde art advisory is committed to providing you with a personalized experience, tailored to your needs and tastes. Overwhelmed by the prospect of selling a household full of items? Leave it to us, you’ve got enough on your plate! With our intimate knowledge of the art, antiques and thrift markets, we’ll make sure you get the full value of your treasures. Who has the time to go through the junk in the attic, or organize the closets of china, stemware and silver? We’ll roll up our sleeves and sort and catalogue your property so you can focus on the important stuff. If you want to make sure your high-value art collection is covered by your insurance plan in the event of theft or damage, the insurance company will likely require an up-to-date appraisal of your scheduled property. It is advised to have an appraisal of your personal property done every three to five years to make sure the values are as current as possible. If you have damaged property due to an accident, fire, flood, or other disaster, you will need the services of a professional appraiser to determine the value before damage, the cost of conservation (if applicable), and the value after damage. The appraisal will help you decide if the cost of conservation is justified against the value of the art, and/or to support a claim to your insurance company. If you donate personal property to qualifying charitable institutions, you can receive a tax deduction on your federal income tax. The IRS will require itemized deductions and, when applicable, a qualified appraisal to demonstrate the value of the property. When a person passes away, the value of the Estate may be subject to federal taxes (colloquially referred to as the Estate tax or “death tax”) if the value of the property exceeds a certain amount. Depending on where you live, there may also be Estate or inheritance taxes due to the state. A qualified Estate appraisal is advised to demonstrate to the IRS and/or local governments that the Estate is or is not subject to the taxes. Additionally, if the dispersal of property has not been specified in the decedent’s will, an appraisal of the full Estate is helpful for executors to fairly distribute property to heirs. Consider talking with your lawyer or accountant about how you can safely and legally minimize taxes on your Estate when you pass (see, for instance, the IRS’s Estate tax and gift tax information**). This will often include the need for professional appraisals of your assets and property. As of 2019, you can gift up to $15,000 in value to someone in a given year without any tax penalty. But if your gift(s) to someone exceed $15,000 in value, you (the gift-giver) owe taxes on the dollar after $15,000 (e.g. if you give someone a gift worth $20,000, you owe gift taxes on $5,000). This gift would need to be declared to the IRS, with a qualified appraisal demonstrating its value for tax purposes. Note that unified credit can be used against gift and Estate tax; be sure to consult with a lawyer, accountant or financial planner about the best strategy for your gift-giving and tax-paying! When separating from your partner, an appraisal of your shared assets—which includes tangible property—will aid in the mutual and equitable distribution of your property. If you must leverage your personal property against any loans or debts, your lending institution will require an appraisal of your personal property to determine its collateral value against the loans. *Avant-Garde Appraisals & Art Advisory LLC is NOT an accounting firm, legal firm nor financial advisory. This list is a general guideline; every client will have unique situations and special circumstances. It is the responsibility of the executor(s), taxpayer(s) and related parties to confer with his/her/their own attorneys, estate planners and/or financial advisors to review the legal and tax requirements of each situation that may call for an appraisal. **This link does not imply a relationship to, or recognition, approval or sanction of Avant-Garde or its appraisers by the IRS; rather, the link is simply provided as a convenient mechanism for the taxpayer’s ease of reference. Furthermore, there is no marketing relationship between Avant-Garde nor its appraisers and the Internal Revenue Service. Avant-Garde Appraisals & Art Advisory LLC is an independent fine art advisory and appraisal firm, specializing in Modern, Postwar and Contemporary art. Avant-Garde also provides advisory, brokerage, organizational and cataloging services for your personal property or Estate. For more information about our services, click here. Avant-Garde was founded in 2017 by Emily Casden. Emily holds a bachelor’s degree in art history from Williams College and a master’s degree in art history from Hunter College (CUNY), with a focus on late-nineteenth and twentieth-century modern art. She is a member of the Appraisers Association of America, with accreditation in Impressionist, Modern, Postwar and Contemporary art. Emily started her professional career as a junior curator at The Jewish Museum, where she worked on a variety of exhibitions over her seven-year tenure. Longing to expand her skillset beyond Museum Mile, Emily transitioned from the museum world to the gallery and auction world, the latter affording her the exhilarating and intimate joy of handling, researching, and cataloging a panoply of objects. In 2015, she completed a Certificate in Appraisal Studies in Fine & Decorative Arts at New York University. About our Home Page image: This print is a parody of a work by the 19th-century French artist Frédéric Bazille, titled The Artist’s Studio (1870). Studio scenes were a clever way for artists to showplace their talent by displaying their various masterpieces on the walls. It was also a way to vaunt one’s reputation, as the artist might include visiting patrons or other luminaries in his/her artistic circle. 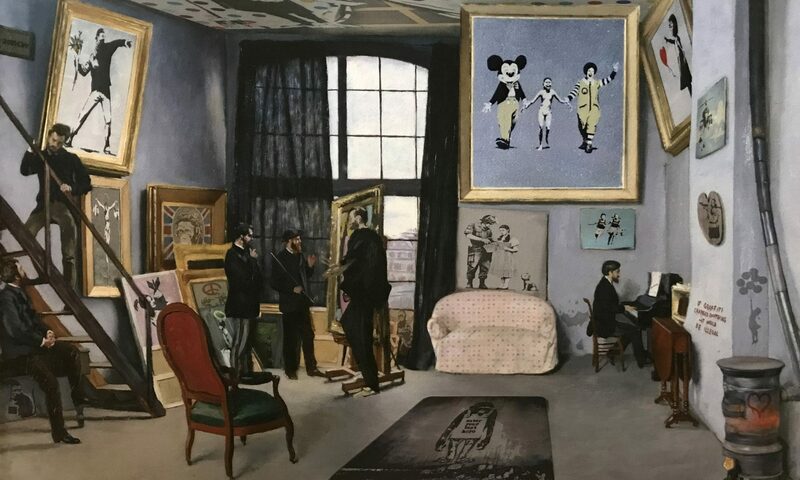 In this image, someone has substituted Bazille’s paintings for works by contemporary artists–mainly works by street artist Banksy and British artist Damien Hirst. Shortly thereafter, Emily joined Doyle Auctioneers & Appraisers, first as an Appraisal Assistant in the Furniture & Decorative Arts Department, and then as manager of Doyle’s Hayloft division, where she researched and catalogued Estate property, and managed the inventory of a 10,000 square foot warehouse. Emily started Avant-Garde in 2017 to bring her diversity of experience to the aid of her clientele. Whether you need a fine arts appraiser, an advisor, cataloguer or organizer, Emily will be on the frontline for you. Contact Avant-Garde to let us know how we may serve you. Email or call us! We look forward to serving you.